Dash Point Park is like three navigational areas merged into one heavily-wooded map: (1) The lower, light green hillside area near the parking, (2) the upper, flat campground area and associated trails, and (3) the hillside trail network at the south end of the park. This 1:10,000 map is spacious enough that it is used for our largest events (Winter O’ and WIOL school league). Another organization uses it for mountain bike races, based out of the southern end that now has a trail head facility. This map has a permanent course. There are many similar trails on the southern, hilly side of the park, where it can be easy to get turned around. Pay close attention to the shapes of trails, use your compass to check its direction, and check contours for whether you should be going uphill or down. Chances are, you’ll be walking up from the lower parking lot to the main park area. This is a heart-pumping warm-up. 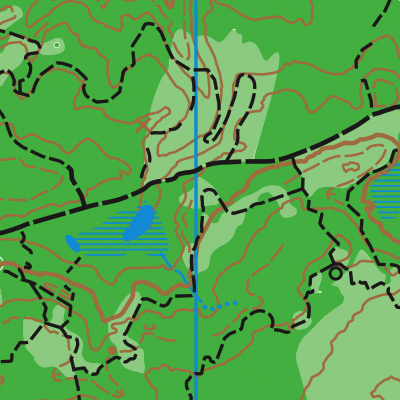 Then, if you are on a longer course, you will be running up and down in the hilly southern part of the map. You will definitely get your workout for the day! A Discover Pass is required to park at Dash Point State Park. From I-5 in Federal Way, take exit 143 (S 320th St). Follow 320th St West for about 4.5 miles to where it ends in a T (and stop sign) at 47th Ave SW. Turn right onto 47th Ave SW, and go 0.4 miles to a stop sign at SW Dash Point Rd. Turn left onto SW Dash Point Rd, and go about 0.8 miles to the turn for the park. At the park entrance roads, turn right onto Beach Road and park in the lot at the bottom of the hill.